It’s the latest Netflix original movie to fight off poor critic scores and be loved by audiences. “The Kissing Booth” follows a teenager named Elle Evans (Joey King), who puts her long friendship with Lee Flynn (Joel Courtney) at risk when she develops a crush on Flynn’s brother Noah (Jacob Elordi). Netflix’s chief content officer, Ted Sarandos, told Vulture that the film is “one of the most-watched movies in the country, and maybe in the world.” Vulture noted that Sarandos didn’t offer any data to prove his comment (Netflix rarely releases audience numbers), but he did cite film database website IMDb as a “good indicator” of what audiences will want to watch. 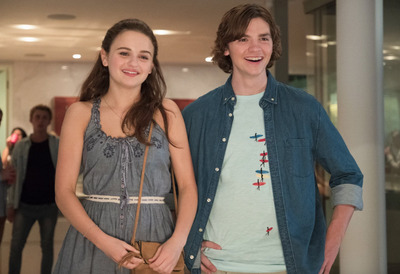 Sarandos said “The Kissing Booth” is the fourth movie on IMDb’s popularity rankings – as of Monday, though, it had dropped to number nine. Still, top 10 isn’t bad for a romcom with a relatively unknown cast that has a 17% critic score on Rotten Tomatoes. That’s just further indication of the power of Netflix. The service’s original movies, such as the critically panned “Bright,” have managed to fight off poor reviews and be adored by viewers. “Bright” has a Rotten Tomatoes critic score of 26% but an audience score of 85%. Meanwhile, “The Kissing Booth” has a 72% audience score. On IMDb, it has a 6.5 out of 10 based on nearly 15,000 ratings. As of Monday, King and Elordi were number 7 and 8 on the list – but again, not bad. “The Kissing Booth” isn’t the first Netflix romcom to take off with viewers. Netflix’s holiday movie “A Christmas Prince,” another romantic comedy, was popular enough for Netflix to announce a sequel – and for dozens of people to watch the movie every day for over two weeks straight. While Netflix’s overall movie catalogue has dipped in recent years, it still plans to focus on original movies. Netflix is set to release at least 80 by the end of this year in an effort to make the service more valuable to its users. If “The Kissing Booth” is any indication, at least by Sarandos’ standards, Netflix is achieving its goal.